So I don't have a lot to say but I had a wonderful day with pumpkins. I ended up going to a pumpkin patch with my friend and her 3 littles. I got myself one and came home and carved it. I do love Halloween. The ones at home were taken by DH the ones at the patch was taken by my friend. She is such a professional I always love her pictures! I love these pics!!! When we move closer I want to hire your friend for some pics! Does she do that? You look SO cute carving that pumpkin. Looking good girl! Great pictures. 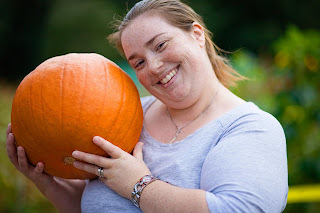 I love the pumpkin patch! Cool pumpkin! Can you believe I've never carved one! Gotta put that on my todo list! :) Looks like so much fun! 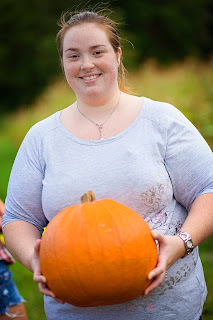 You need to make sure to pick out your own pumpkin if you are going to carve it!